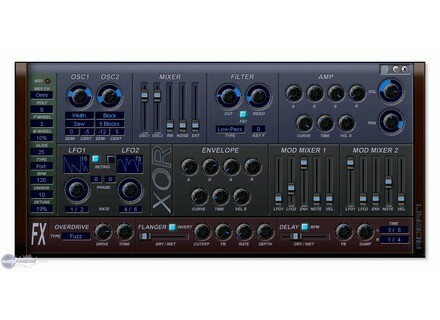 Xor, Virtual wavetable synth from Adern. Adern has announced the release of two new plugins for the Scope platform. Xor is a Variable Wave synthesizer. 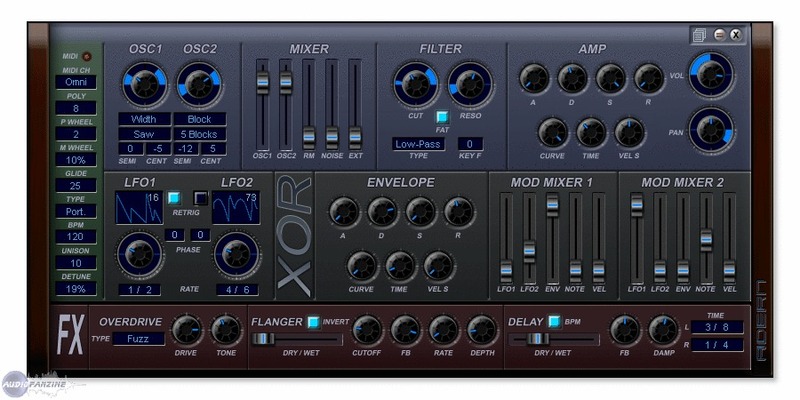 Xor's combination of varying waveform oscillators, multi-mode filter, diverse pattern LFOs and modulation routing is designed to allow the creation of "new and exciting soundscapes revealing the darker, and electric side of Scope," according to Adern. Mojo is a dynamic guitar amp emulation. Mojo has been designed "to achieve the most expressive tone in current emulations, have a smooth, elegant, very light crunch and be extremely dynamic and touch responsive," according to the company. Xor and Mojo have functional demos on Adern's site. Adern's online shop is offering a time limited discount to all of its products until May 1st 2009. Requirements: u SonicCore (Creamware) Scope DSP board system. For more info check out www.adern.com. Zynewave Podium Update (Again) Zynewave has updated Podium to v2.12.